In our ongoing Brujeria Class Series, Lou Florez (Awo Ifandunsin Sangobiyi) and Napaquetzalli will share magic and rituals to attract, enhance, and heal the love and partnerships in our lives. These classes share in depth wisdom from our diverse spiritual practices blending Mexican folk magic/brujeria and Southern rootwork/conjure. We explore topics such as candle work, magical uses of plants and oils, sacred baths and washes, and much more. We learn how to effectively utilize these ancestral tools to direct our intentions and manifest our desires. Our traditional magical practices are filled with wild and juicy ways to increase our love vibration and draw that energy towards us! Lou Florez (Awo Ifadunsin Sangobiyi) is an internationally known spirit worker, medicine maker, priest, activist, and artist who has studied with indigenous communities and elders throughout the globe. He is trained and experiences in hoodoo/Southern conjure, curanderismo/Mexican folk magic, as well as Paganism and European Witchcraft. He serves as Awo/High Priest of IFA for the Ile Ori Oakland temple. Lou grounds his teachings and practice in the idea that connectedness to ourselves and our physical, emotional, spiritual, and environmental landscapes is a fundamental necessity for any long lasting change to occur. He holds that through creating these living, dynamic relationships we become conscious of the inherent power available to us in every second of our lives. Napaquetzalli is a queer Xicana/Indigenous herbalist and healer. 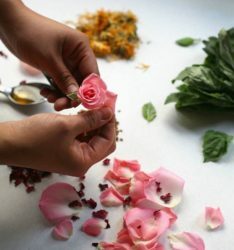 Napa has studied both traditional Mexican curanderismo as well as clinical Western herbalism, with a passion for creating accessible and culturally relevant herbal medicine for the community. Napa is a co-founder of Curanderas Sin Fronteras, a collective that provides spiritual and herbal support for the Bay Area Latinx community and also works as an herbalist at the Scarlet Sage Herb Co. in SF Mission District. Their practice is rooted in helping others reconnect to ancestral and intuitive knowledge, as well as decolonizing our relationships to the earth, our bodies, and each other.